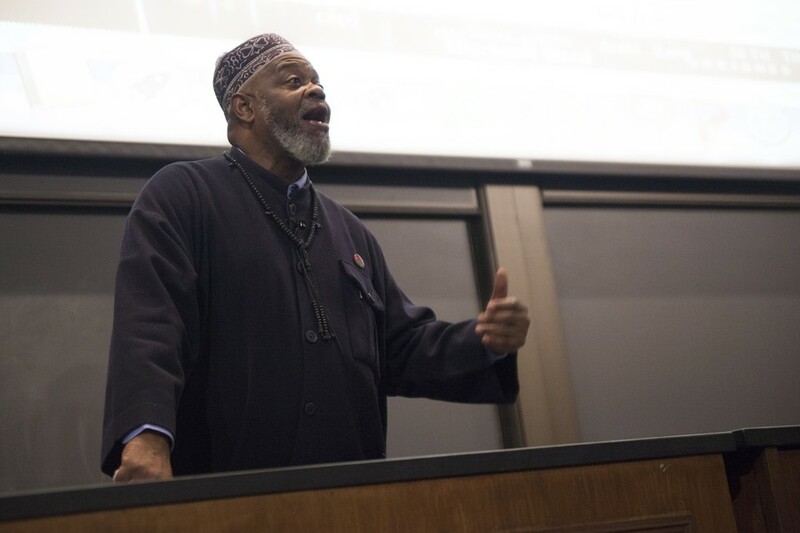 Imam Talib ‘Abdur-Rashid, leader of the Mosque of Islamic Brotherhood (MIB), spoke about race relations among Muslims in the United States in a lecture entitled “Malcolm X: Reclaiming his Legacy” in Kent Hall Wednesday night. The lecture was hosted by the University’s Muslim Students Association (MSA). According to Vice President and third-year Aseal Tineh, ‘Abdur-Rashid was chosen to speak to open discussion on a controversial figure and because February 21 marked the 49th anniversary of Malcolm X’s death in 1965. ‘Abdur-Rashid opened with a video clip of a recent controversy in which a Queens teacher instructed her fourth-grade students not to present on Malcolm X for a project on a black leader of their choice. “There is a tendency in this country to hold Dr. Martin Luther King, Jr. on a pedestal when talking about black history and about the civil rights movement. But this point of view doesn’t give attention to [Malcolm X], the giant at the other end of the fork,” ‘Abdur-Rashid said. The MIB is a predominantly black Sunni Muslim organization based in New York City’s Harlem. It is the present-day continuation of Muslim Mosque, Inc., a religious organization founded by Malcolm X in 1964. ‘Abdur-Rashid also suggested that the connection between the black struggle and Islam is downplayed in the American educational system. “When teaching slavery, schools tend to gloss over certain facts…in the 1850s, there existed a community of escaped slaves that lived in the Great Dismal Swamp, in North Carolina. One of their leaders, whom the whites were most afraid of, was nicknamed ‘General Usman.’ Usman! That’s a Muslim name! Here at the U of C, in your history classes, do they ever teach points like this? No? Yeah, I didn’t think so,” he said. In a response to a question posed by MSA President Zahed Haseeb on whether a rift exists between immigrant American Muslims and established American Muslim communities, ‘Abdur-Rashid argued that division exists among American Muslims on several fronts. “The Muslim community in America is in denial concerning issues of race, class, and ethnicity. Arab and Desi [South Asian] Muslims simply don’t interact with black and Latino Muslims…. Nobody wants to call anybody out. And that’s a problem,” ‘Abdur-Rashid said. Some members of the MSA, such as Haseeb and Tineh, saw some validity in ‘Abdur-Rashid’s assessment of intra-Muslim relations in the United States. “As [‘Abdur-Rashid] was speaking, I thought of my own volunteer work, both inside and outside the University, and in the organizations that I am a part of, black members are almost nonexistent. It’s certainly a problem, although I think the trend is that it is getting better,” Tineh said.